I hope everyone started today off well! I am feeling pretty good today. Do you ever have days when you wake up and feel strong? Well, I actually feel really strong today. This morning was an earlier one for everyone here since the boys both had art club this morning. I got up at 5:40am before the alarm even went off. The cats even thought it was too early...they didn't even move when I got up and normally they are all over me first thing. Anyway, I got up, did a great boxing workout, focused on my arms and shoulders (since I did legs yesterday), went on a beautiful walk and then did a little yoga (hello old friend). Yep, this is going to be a great Wednesday! Back it up to last night...ya'll (you all - for the non-southerners) I made gluten free, dairy free fried chicken last night. I am pretty sure my husband will stay with me forever now. Yes, I know fried chicken is not the healthiest thing in the world for you, but it has been a year since the illustrator has eaten' it and his southern boy gene was starting to go through withdrawals. 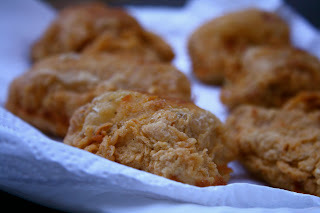 I have to admit that I have not fried chicken since I was in culinary school (if even that). I don't like fried foods and never have (unless we are talking apple fritters and we all have exceptions to our rules) so this was kind of a big deal for me. I don't like to fry things at home because it makes the whole house stink or so I thought. I did a lot of research on the subject since I am not seasoned with the whole frying thing (pun intended). In the end I decided to use my southern intuition and just go with the flow. The illustrator said he wanted just plain fried chicken...nothing crazy. So, that is what I did. Ya'll know I made it the healthiest I could. This was boneless skinless chicken breast, it was fried at exactly 350 degrees and then placed on paper towels to drain. I used peanut oil and it did not smell at all. I was really surprised. Don't get me wrong, I won't be doing this all the time, but as anyone who has dietary restrictions knows, living without your favorites forever is not fun! 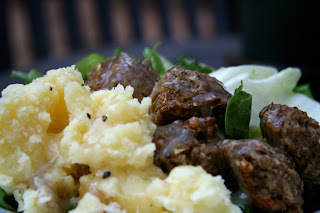 My inner southern girl wanted smashed potatoes and gravy. I wanted a lighter gravy though to offset the heaviness of the rest of the meal. I also made some mini lentil oat burgers to have as my protein. I left out the veggies, added shredded onion and made them with my small scoop...they turned out well. Oh and I was apparently the only one interested in greens with dinner, so I ate it all on a bed of lettuce. We were all happy campers last night after this. Mix the eggs and almond milk in a bowl and set aside. Place the flour in a separate bowl. Bring the water to a boil with the bouillon cube. Mix the cornstarch and flour with 2 TBSP cold water and then pour it slowly into the broth while whisking the broth quickly. Bring to a boil and whisk until thick. Salt and pepper to taste. ***The illustrator ate a salad with his chicken today for lunch. 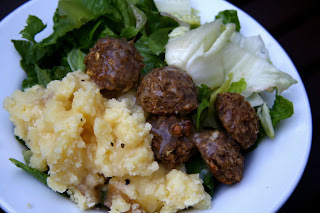 I am entering this in the glutenfreehomemaker's Gluten Free Wednesday. Ok, give me your guilty pleasures...what food do you splurge on from time to time? Um, you know my splurge food: PIZZA! :-) Thanks for the gravy recipe. Jason likes gravy and I don't really care too much for it, but this would be great to use over maybe seitan "steaks" too. Okay, I want to move in with you. Please? Thats some quality looking fried chicken too! I'm not a huge fried chicken fan either but I even want to eat that. My splurge food is either Mexican or pizza. I enjoy making healthier versions but just LOVE the regular ones. Mmmm that chicken looks delicious! thanks for the great comments today hon! i haven't had fried chicken in....years?!? that has to change! I really didn't even know that you can make fried chicken without the skin. Good for you for making a healthier version of a food you love. 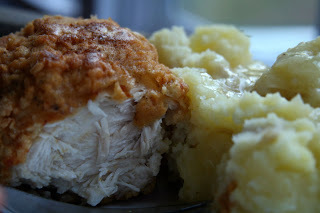 I have never made fried chicken at home, although I would love to eat it! oh my gosh, the southern girl in me really wants that fried chicken!! I haven't had fried chicken in a long long time. Yours looks perfect. By the way, I love the milk carton look of your blog, very cool. Oh I love fried chicken! Cold fried chicken is my super favorite! YUM! I am lactose intolerant since age 8. I am now 61 years young. In reading the non-dairy fried chicken recipie, I am inquiring how does the flour and seasoning stick to the chicken's skin if no protien such as an egg wash is done? The almond milk sounds pretty good. 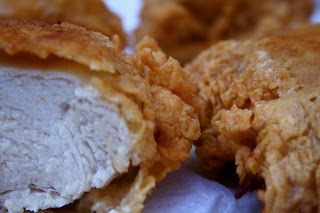 My last venture into frying a non-dairy fried chicken was a culinary disaster. Nothing came out right. I will try this recipie and post later. Many thanks for the suggestion! We brine our chicken overnight in faux buttermilk: soy milk with vinegar (1T vinegar to 1C soy milk). Makes it real juicy. Season with whatever seasoning you like and then do the flour dredge.